Want to Transfer Audio Books from iPhone to Computer? Click Here! Home> Resource> iOS Transfer> Want to Transfer Audio Books from iPhone to Computer? Click Here! - The audio books are audio files that can be stored in smart phones or tablet so that the readers can bring them wherever they go. - You need to use eyes and find a quiet and bright place with a chair if you want to read the traditional paper books. However, you just need a smart phone and earphone if you want to listen to the audio books, then you can enjoy the listening no matter you are in the train, bus or the walk. - Listening to the books is helpful to protect the eyes since there are many people who are shortsighted. - It will also benefit people's oral speaking. 1. The software cannot only help you transfer audio books but also enable you to back up other files like contacts, SMS messages, photos, music, videos and so on from iPhone to computer. 2. 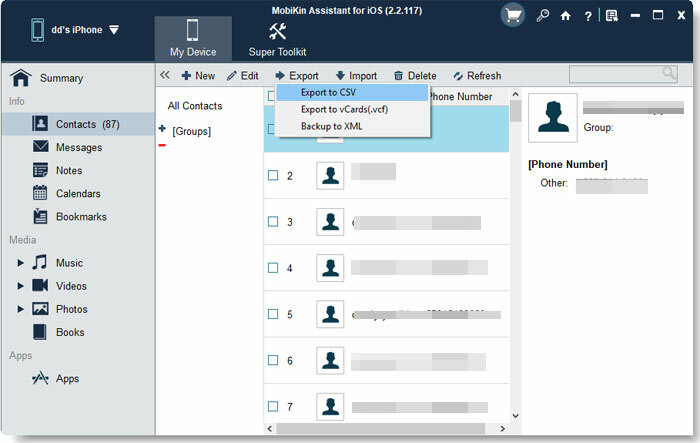 The program can support to various iOS devices including iPhone, iPad and iPod to work well. By the way there are two versions available. One is the Windows version and the other one is the Mac version. 3. The operation of the software is simple and easy. The software will display all the files on the interface and you can select all the wanted files to transfer with one click. Click the icons according to the operating system of your computer to download the correct version for your computer. Then install it on your computer. Use a USB cable to link your iPhone to PC and run the program. 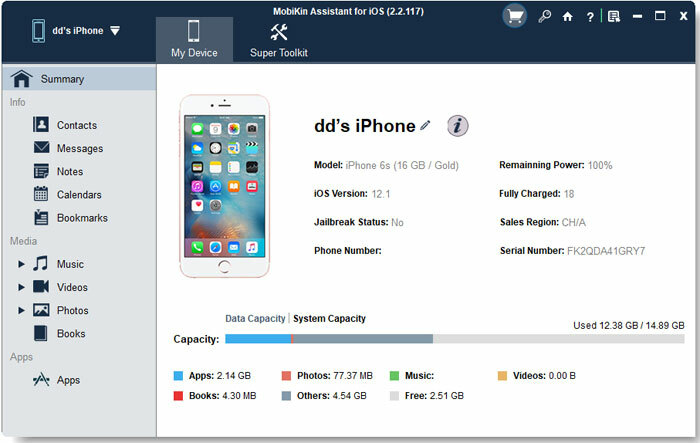 The software will detect your device and you will see an interface like this with many categories list on the left column and the main parameters of your device on the right panel. Click the Audiobooks on the left panel to preview the detailed information of the audiobooks that saved on your device. Then mark the files you want to keep on the computer and hit the Export button. Note:The processes of transferring other files to the computer are similar to this guide.